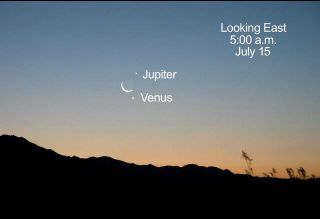 This image shows the bright planets Venus and Jupiter meeting the crescent moon on July 15, 2012. Venus, Jupiter and the moon will gather together in the early morning sky Sunday (July 15), and provided the weather conditions cooperate, the celestial show will be well worth getting out of bed. Should weather conditions be favorable, set your alarm clock for around 4:30 a.m. local time on Sunday, and then proceed to a location where you will have a clear and unobstructed view of the east-northeast sky. Rather than partake in the usual "inside-the-eyelid show" at that somewhat ungodly hour, you can instead be rewarded with a view of a beautiful celestial gathering, as the slender crescent moon, just 13-percent illuminated, appears in close proximity to the two brightest planets in our sky. Early risers who are up an hour or two before sunrise, and who are unaware or have no advance notice, will almost certainly wonder, as they cast a casual glance toward the skinny moon that morning, what those two "large silvery stars" happen to be. Sometimes, such an occasion brings with it a sudden spike of phone calls to local planetariums, weather offices and even police precincts. Not a few of these calls excitedly inquire about "the UFOs" that are hovering close to our natural satellite. If bad weather or clouds spoil your view, you can also watch the planetary sky show online via live telescope views from the Slooh Space Camera website. This cosmic scene between the two brightest planets and a crescent moon will be somewhat reminiscent of a similar three-way gathering that took place in the evening sky on the last weekend of February. No other star or planet in the night sky can come close to matching Venus in brilliance. Right now Venus is shining at its peak brilliance for its anticipated morning meet-up, and is more than 17 times brighter than Sirius, the brightest star in the sky. This summer, Venus is the unrivaled morning star, and will soar from excellent to magnificent prominence in the east-northeast sky at dawn. The planet will be visible 2.5 hours before the sun rises on July 15, with that period growing to 3.5 hours by August 15. In fact, if the air is very clear and the sky is a good, deep blue, try looking for Venus shortly after sunrise. Once you know where to look, you should be able to see it in the daytime long after the sun has come up, appearing as a tiny white "speck" against the blue sky. Meanwhile, Jupiter, dazzling in its own right, though just 1/9th as bright as Venus, is also becoming increasingly prominent in the morning sky, rising about 3.5 minutes earlier and climbing progressively higher each morning. Also on Sunday evening, you may be able to see the full globe of the moon, its darkened portion glowing with a bluish-gray hue interposed between the sunlit crescent and only a bit of darker sky. This vision is sometimes called "the new moon in the old moon’s arms." Leonardo da Vinci (1452-1519) was the first to recognize it as what we now call "Earthshine." The effect is caused by sunlight bouncing off the clouds and ocean waters of our planet that is reflected up toward the part of the moon not illuminated by sunlight. As a bonus, this arrangement of the moon together with Venus and Jupiter will be positioned below the famous Pleiades star cluster, and will also be set against a fine V-shaped cluster of stars known as the Hyades. Note the bright orange star at the end of the lower arm of the V, which represents the angry, fiery eye of the constellation of Taurus, the Bull. This colorful star is Aldebaran, "the Follower;" for it rises soon after the Pleiades and seems to pursue them across the sky. This skymap shows the position of Venus and Jupiter, in relation to the bright star Aldebaran and the Hyades and Pleiades star clusters, in the eastern sky on July 15, 2012. Keep in mind that this head-turning display will be merely an illusion of perspective: on Sunday, the moon will be only about 249,000 miles (401,000 kilometers) from Earth, while Venus is 175 times farther away, at 43.6 million miles (149.67 million km). Meanwhile, Jupiter is almost 2,115 times farther away than the moon, at 526.7 million miles (847.4 million km). Meanwhile, the Hyades — the nearest example of an open star cluster relative to our solar system — is located about 150 light-years away. Aldebaran, which from our vantage point appears to be a part of the Hyades, really isn’t. The star just happens to be an innocent bystander, merely located by chance in the line of sight between us and the Hyades star cluster. Aldebaran is, in fact, 65 light-years away, which is less than half the distance of the Hyades cluster.